Lounging Cat Garden Sculpture...yet another addition to the Dupere Cat Collection is the Lounging Cat...be it indoors or out, the lounging cat garden sculpture is an ideal gift for all cat lovers. Whether it be a sitting cat, a cat climbing, or a stretching cat, Dupere's Lounging Cat Rusted Metal Garden Sculpture is bound to delight all cat lovers. 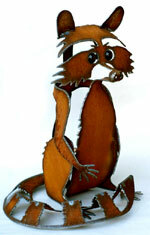 A full-time artist living in Arizona, Henry Dupere is a skilled & passionate metal sculptor. His imagination, sense of humor, & love of nature are expressed in his unique rusted metal garden sculptures!!! All of the garden art sculptures in the Dupere collection can be used to add a touch of distinction to any garden or home decor. 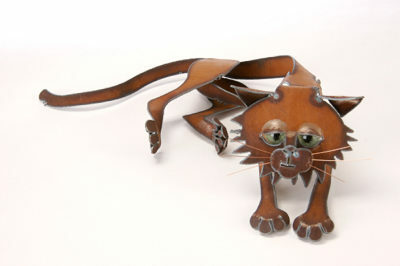 Henry Dupere Lounging / Lying Rusted Metal Cat Garden Sculpture. Size: 18" long by 10" long. Three dimensional rusted metal Lounging / Resting Cat garden Sculpture. Hand-crafted & made with pride in the U.S.A.